As of June 30, 2018 Immigration and Customs Enforcement (ICE) held 44,435 individuals in custody. Individuals were being held in 217 detention facilities located in 180 U.S. counties spread across 43 states and 3 territories. The number of ICE detainees was up from 39,082 persons ICE held in custody at the end of FY 2015. Case-by-case records on each of these 44,435 individuals held in ICE custody were recently obtained by the Transactional Records Access Clearinghouse (TRAC) at Syracuse University. These data provide a detailed snapshot of ICE custody practices. Highlights from this latest data are summarized below. 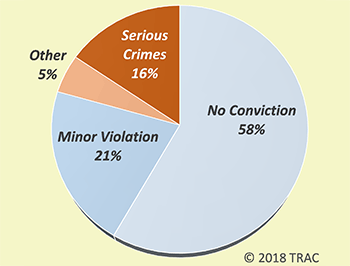 The vast majority (58%) of individuals in ICE custody June 30 had no criminal record. An even larger proportion—four out of five—either had no record, or had only committed a minor offense such as a traffic violation. This left just one out of five who had been convicted of what ICE classified as a felony. Of these only 16 percent were what ICE defines as a serious, or Level 1, offense. Even among Level 1 offenses ICE included crimes such as "selling marijuana" which many states have now legalized. See Figure 1. Detainees Had Resided Continuously in U.S.
For those who had been convicted, the most frequent crime was illegal entry (a misdemeanor), followed by driving under the influence of alcohol. Conviction for a miscellaneous assault was third, and a simple traffic offense was the fourth most frequent offense. Individuals were mainly from four countries. Forty-three percent were from the Central American countries of Guatemala, Honduras and El Salvador, while an additional 25 percent were Mexicans. The next largest number—5 percent—were from India, while 4 percent were citizens of Cuba. None of the other nationalities made up more than one percent of those held in custody by ICE. One out of six were females. Five out of six were male. ICE withheld information on their year of birth so we do not know their ages. However, for those ICE recorded the date they last entered the U.S., 18 percent had resided continuously in the U.S. for ten years or more, and one out of four had been in the country for at least five years. See Figure 2. As of the end of June 2018, detention facilities in one state - Texas - held 29 percent of all ICE detainees. An additional nine states held a thousand or more individuals, and together with Texas accounted for where four out of five of ICE detainees were being held. See Figure 3. The data document the dominance of private for-profit prisons in the large-scale detention of ICE detainees. 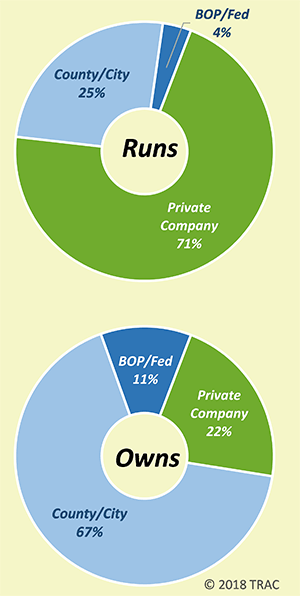 Overall, fully 71 percent of detainees were housed in facilities operated by private companies. The rest of the facilities were operated by government, including by counties, cities, and the federal government. However, many fewer of the facilities operated by private companies were actually owned by these companies. Two out of three (67%) were owned by counties and municipalities, while an additional 11 percent were owned by the federal government. Only the GEO Group and CoreCivic (CCA) actually owned any of the detention facilities they operated. See Figure 4. The largest number of ICE detainees—1,839—were locked up at the Stewart Detention Center located in Lumpkin, Georgia. This county-owned facility is operated by CoreCivic, a private company formerly named Corrections Corporation of America (CCA). Two other detention facilities had closely equivalent numbers of detainees. The Adelanto ICE Processing Center in San Bernardino County, California held 1,831 detainees as of the end of June 2018. While the South Texas ICE Processing Center in Pearsall, Texas held 1,815 detainees. Both the facility in California and the one in Texas are operated by another private company, the GEO Group, Inc. Ten detention facilities located in six states each housed at least one thousand detainees and accounted for nearly one-third of all individuals held in ICE custody at the end of June. These facilities are shown in Figure 5. Each of these were operated by private companies: five by the GEO Group, four by CoreCivic (CCA), and the tenth was staffed by guards from Ahta, Inc. The next five with the largest detainee population were also operated by private companies. In addition to the three companies already listed, these private prison firms included the Management and Training Corporation which operated two facilities. The remaining three were again run by the GEO Group and CoreCivic (CCA). How Long Had Individuals Been in ICE Detention? Table 1. How Long Had Individuals Been Detained? Many individuals had stayed a relatively short period of time. Forty-one percent had thus far stayed in ICE custody for 30 days or less. At the other extreme, a sizable number of individuals had remained locked up for a considerable period of time and continued to be detained. About 13 percent of the individuals had been detained by ICE for more than 6 months. Nearly 2000 had been detained for over a year, and a few individuals had already been detained for over ten years. Two originally entered ICE custody in February of 2007 and according to ICE records had been locked up continuously since then. See Table 1. An accompanying free ICE Detention app allows the public to probe these data for further details on each individual and ICE detention facility. The app features information about each detention facility including its name, state and county location, how long detainees had been held, and details on its ownership and operation. This is combined with specifics on the individuals held in each facility, including their nationality, gender, length of residence in the U.S., and criminal record. Whether ICE recorded the individual was a legal permanent resident, or flagged that the individual was a refugee or asylum seeker is also noted. These percentages apply to the composition of individuals in custody at a particular point in time. 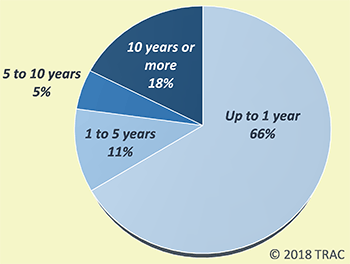 Because short-stayers are by definition in and out more quickly, they make up an even larger proportion of the distribution of individuals ever held in custody over the span of a full year.